Heads up, Metro Green Line riders: Redondo Beach Station will be closed for signals system improvements starting 9 p.m. Friday, September 12, until close of service Sunday, September 14. During this time, free shuttle buses will replace rail service between Douglas and Redondo Beach Station. 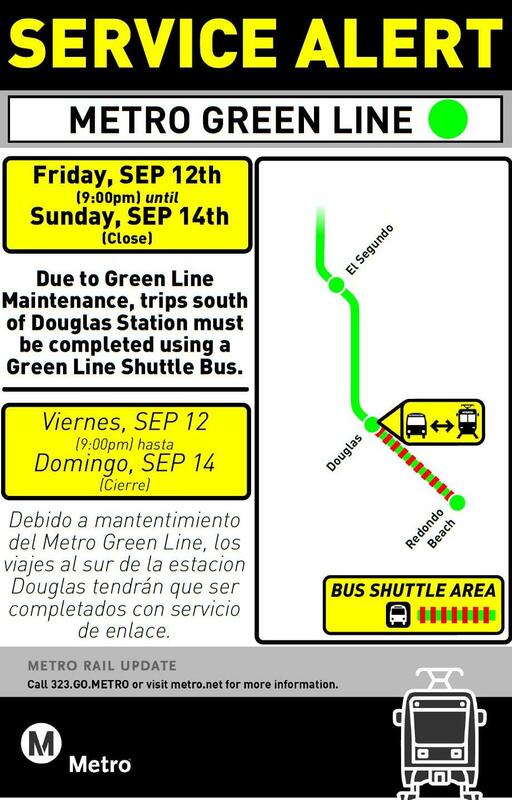 Metro Green Line westbound rail service will end at Douglas Station, and all eastbound trains will depart from Douglas. Customers requiring service to/from Redondo Beach Station will be able to ride the shuttle buses at no charge. Shuttles will depart eastbound from Redondo Beach bus bay 3 and westbound from Douglas Station at the same Green Line weekend service levels. They will be scheduled to meet trains for transfer. Identifying designated shuttle buses will be easy; just look for Metro buses with head signs reading “Green Line Bus.” Customers utilizing the shuttle should please allow a little extra time to connect to their destination station. Keep reading for more information about the improvements being done. The bus shuttle map is also after the jump. Finally, a little more about the aforemention signals system improvements. Metro is currently in the process of replacing the core electronic train control system at each station along the Green Line. Tests of the system are usually run at night after close of service, however, there is a final test required at each station that takes 48 hours to perform. Redondo Beach Station is the site of our first 48 hour test. The process is slated to move east to every station along the Green Line over the next two years. We will continue to update The Source with more information on the project as it progresses. You can also check the Metro.net Service Advisories page for rail alerts or follow Metro on Twitter @metrolosangeles or @metrolaalerts.